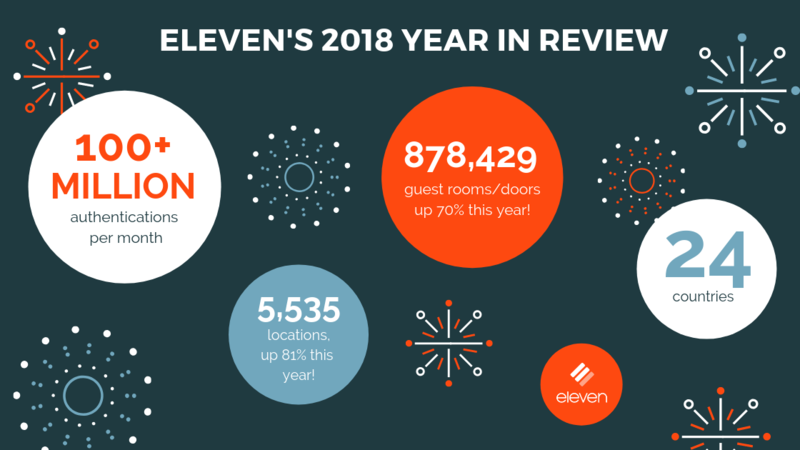 Today, ElevenOS is simplifying connectivity in nearly 900,000 guest rooms/doors in over 5,500 locations in more than 20 countries. While our biggest growth came in the hospitality industry, we also experienced strong momentum in the MDU/multifamily segment. Our official ElevenOS for MDU product launch is coming in early 2019, and we predict it will be the year we see our platform really take off in this growing market. We see a lot of parallels between hospitality and MDU, and we are excited to help simplify connectivity in apartments, student housing, and beyond. ElevenOS Site Manager: Eleven continues to innovate to create solutions that are must-haves for hotel and apartment property managers. The new ElevenOS dashboard, called Site Manager, puts real-time data about Wi-Fi usage, revenue and performance directly into the hands of property managers to address network issues before they affect the guest experience and ensure compliance with brand standards. Built-in tools allow non-technical staff to create portals, assign access codes, manage devices and schedule conferences for their properties independently to reduce support costs and allow our partners to focus on bigger opportunities. Captive Portal Improvements: our Portal Manager is an easy-to-use, customizable content management system for creating, editing, and managing captive portals in ElevenOS. Portal Manager offers generic templates that can be edited at the global and property levels as well as brand standard templates that provide a consistent guest Wi-Fi experience across all properties. Our latest Flex Template contains a highly customizable form in order to collect unique guest data and push to CRM, loyalty, and other databases. Infrastructure Improvements with AWS: Now running fully on Amazon Web Services (AWS), ElevenOS has the infrastructure in place to scale and meet the needs of our global customers of all sizes. Our infrastructure improvements enhance our platform’s performance, reliability, resilience, and security. With numerous hardware and software integrations and 40+ global partners, Eleven’s growing ecosystem ensures hotels and MDU properties of all sizes can improve their guest Wi-Fi experience without the need to replace backend infrastructure. This year we added an integration with Mikrotik and completely updated our integration with Cisco Meraki, We look forward to expanding our integrations in 2019. From all 35 of us here at Eleven, we’d like to extend a warm thank you to all of our customers and partners for a great 2018. We look forward to more connection in the new year!